Can there be a more elegant way to travel than a night train between two cities? The idea that you board one night, have a quick dinner and a few drinks, make new friends, retire to your own private compartment and wake up in a new town is very romantic. The actual experience never quite lives up to the hype. After racing from Watamu to Mombasa on a tuktuk, two matatus, another tuktuk and a short walk/run, the train was delayed. We were prepared having heard that the train often arrived in Nairobi 2-4 hours late. One person in Watamu informed us that her last night train was 7 hours late which for a journey scheduled to last about 13 hours is a significant delay. Not everyone on board was expecting it. We boarded at 6:40 for our 7:00 departure. At 7:10, they first told us that we would be delayed for a few minutes. At 7:35, we were informed that the engine for the train should arrive in 10 minutes. It seemed an odd time to mention that there was no possible way the train could move, but that was the last official update we received regarding the journey. Fifteen minutes later (and still before the engine arrived), they came through the train ringing the dinner bell as if all were perfectly normal, so we went to dinner. As the soup arrived, we pulled out of the station, several hours before New Years, to much rejoicing. Then the train stopped. Total distance traveled, less than 100m. The third class cars were still at the platform. By the end of dinner, we had stayed moving again, but this time we were going “back to the station” as if we had really left. Apparently there were problems with that engine. The original scheduled arrival time into Nairobi was between 7:30 and 10:00, depending on who you spoke with. The Spanish family in the compartment next to us was used to European trains and assumed this gave them plenty of time to catch their 2:00 flight home. With each delay, they got more anxious. Some Canadian, who had gotten on the flight after the “last flight” out of Juba, South Sudan, started taking bets on whether we would ring in the new year on the platform. When they started, we had four hours until mid night and they seemed overly pessimistic, but with under 90 minutes to go, it seemed more plausible. The second engine arrived, we rushed to reboard, waited, then departed the station again with twenty minutes to spare before 2014. Many of us gathered in the dining car to celebrate the new year together. The Spaniards were busy talking with the staff to figure out how they would make their flight. And Australian brought out a fiddle; I got out the straws and we sang in 2014 with style. As I was gently rocking to sleep, it felt like the train was slowing. That made it easier to sleep and we had no place to be, so we sleep soundly. We awoke outside a mosque during the morning call to prayer. The train had stopped to let the Spanish family off. They were taking a cab from there. During the six hours we slept, the train had gone less than 50 miles. Apparently, engine number two broke and we were waiting for engine number three. Despite still being significantly closer to Mombasa than Nairobi, most passengers remained in high spirits and laughed off the delays. About half the people we hung out with worked for NGOs and had been evacuated from South Sudan as the fighting intensified. So there we all sat, in the middle of nowhere, Kenya. The third engine arrived and we continued our journey around 8:00. Before long, it was time for breakfast. The passing countryside was lovely, right out of a postcard, and we agreed that it was better to have seen this than slept through it last night. The next time the train stopped, there was nothing to do but laugh. Luckily, this was a planned stop and despite looking like a field with a shed near the tracks, we were assured that this was an official station. We slowly continued on towards Nairobi, not wanting to stain the engine too much. After lunch and several more station stops, we were within 50 miles of Nairobi and closing in on the 24 hour mark on the train. 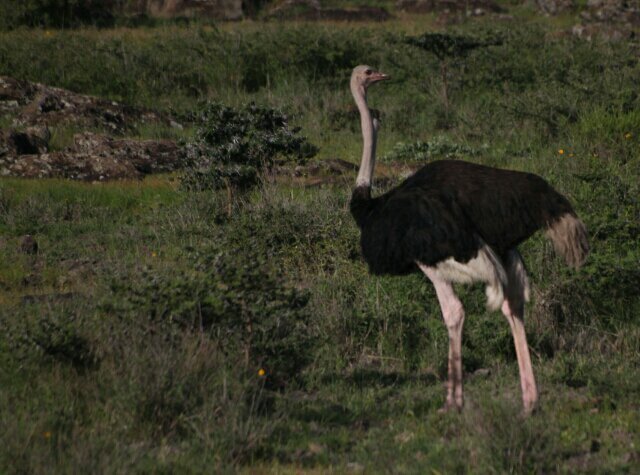 As afternoon turned into evening, the wildlife came out again and the ride became a safari. From the window of the train, we saw zebras, giraffes, wildebeest, ostriches, gazelle and a few large birds we couldn’t identify. 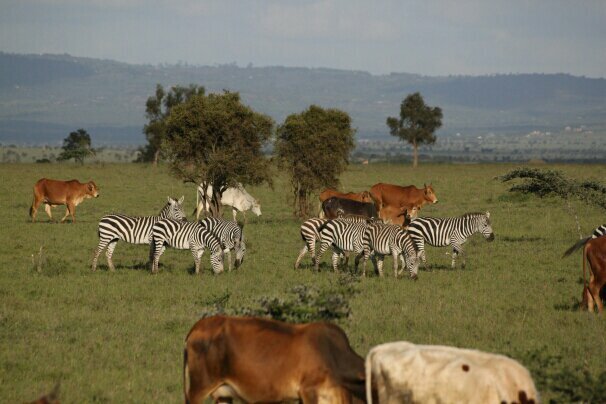 The wild animals sharing grazing area with cattle and goats seemed odd, but wonderful as well. It didn’t feel like there was as much distinction between urban and wild as we experience the states. We eventually roll into Nairobi, first the slums, then into downtown around 6:30. We were just shy of a full day on the train. As we departed, we planned to meet up with a few of the other passengers later that night for drinks. We were all curious to know if our Spanish friends made their flight, but had no way to tell. What a memorable experience. Once we got to the hotel, showered and ate, we were too tired to go out for drinks and collapsed on the bed. Next stop, safari in Samburu. Well, the “boys” were sacked out on the floor and not at all interested in seeing pics of the zebras grazing with cattle but I was pleased to have gotten your posting before heading off to bed to do what Dom looked like she was doing in the pic from your train cabin. 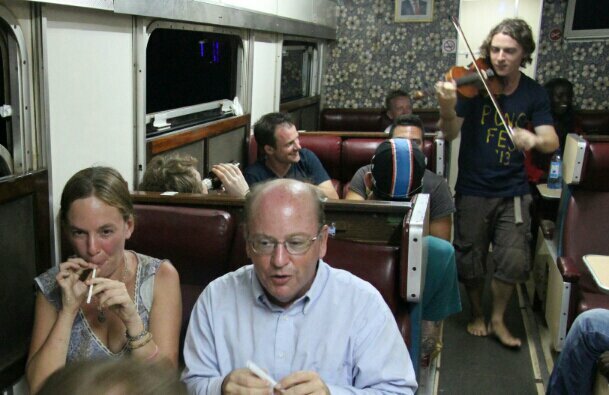 Despite the delays, it sounds like you all had some fun times and the dining car looks like it held a great group of people, including the straw flute band. Can’t wait to hear about Samburu and see more pictures. I’m off to work tomorrow with two (very clean) doggies who have begged to come along. They were jumping in and out “helping” when I was getting the seat arrangements ready to accommodate my furry four-footed friends. What is the time difference between us, anyway? lots of love to you both as we head off to bed.